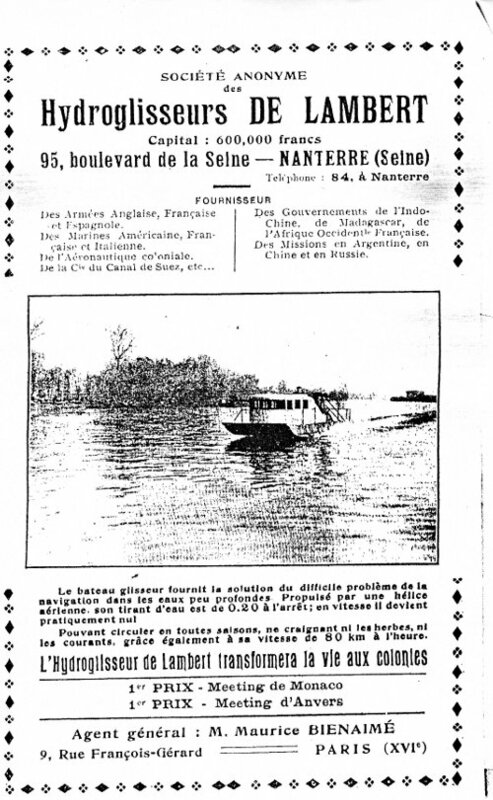 Still in 1929, he wants to appoint an agent in Belgium, with which he no doubt tries to open the African market and thereby hopes to correct his financial situation and to reorganize his business. Because, thanks to the talent of his maker, the invention offers perspectives to large powers eager for to colonial power. Besides extensive unexplored territories like Brazil, offer a source of considerable revenues for any industrial. Nevertheless and rather quickly, the successes of the hydroplanes are not sufficient to cover the expenses. Charles de Lambert, no longer in possession of his own parental heritage, has to, in the time he against his better judgment aspires to expand his firm, unceasingly look out for money. His friend Paul Tissandier has become his business associate, he seems to know more about doing business. In any case he is careful but it becomes evident his influence on the decisions of the marquis are of little importance only. His affection, his admiration for the inventor, must have been more intense than his sense of reality. 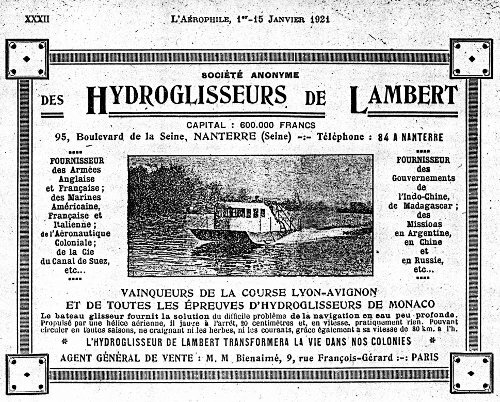 In 1926, when bankruptcy threatens, he is prepared to lend Charles de Lambert 120.000 French francs, in order to purchase a terrain of more than 13.000 m² in Nanterre.